We reported about Haddrick’s Mill before. 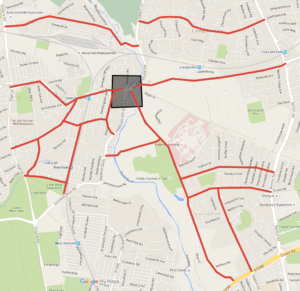 Its connection to the ‘Northern Access Corridor’ council plans makes it quite an urgent topic. In the previous article on Haddrick’s Mill, we laid out the idea of re-figurating this complex junction in Newcastle to reduce motor traffic from this area of Newcastle. In articles before we discussed Haddrick’s Mill in more general terms and talked more specifically about the cycle infrastructure required to bring it up to Dutch standards. This article will make an assumption: we think that reconfiguration of the junction is not something that the council are currently willing do. Hence we describe what alternatives could be used to improve the environment of the area and the surrounding roads. We are looking at it from the transport planning, accessibility and connectivity angle. Groningen, Newcastle’s twin city, has a transport planning philosophy centred around achieving directness for cycling and walking routes by ‘unbundling’ these from motor traffic routes which are organised at a larger grid distance. This is called mode-filtered zoning. How can this be applied to Newcastle? From Newcastle council documents we understand that the route of the Northern Access Corridor runs between Cowgate junction (North West Newcastle) through Haddrick’s Mill Junction ans onwards into North Tyneside. North Tyneside council have published plans for the A191 which have been linked to the Northern Access Corridor. It may seem obvious at first that the motor-traffic route should run on the shortest route between Haddrick’s Mill and Four Lane Ends along Benton Park Road. Instead we suggest that (if the council do remain committed to providing a Northern Access Corridor, they certainly still need to explain and justify its purpose!) it should run along the route we have drawn below. Mode-filtered zoning. Showing the route for motor vehicles. 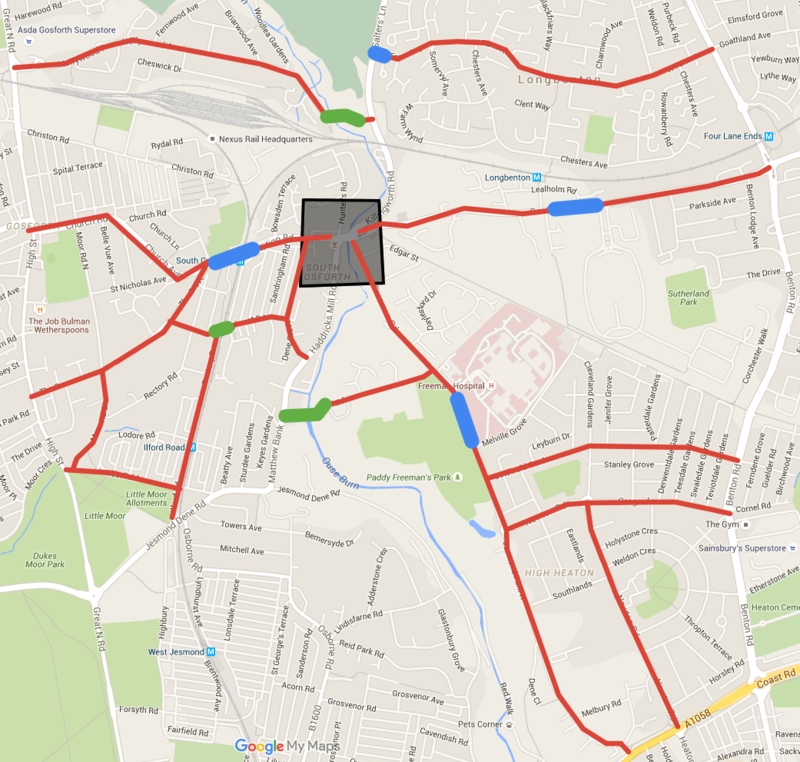 The Orange section (West) is the known council-proposed route in Newcastle, the Red section (East) is the route linked to North Tyneside plans, and the Blue route shows our suggestion. When the small Black box is Haddrick’s Mill itself. While this route maintains access across the North of City, this longer route should help reduce the use as a motor through route. 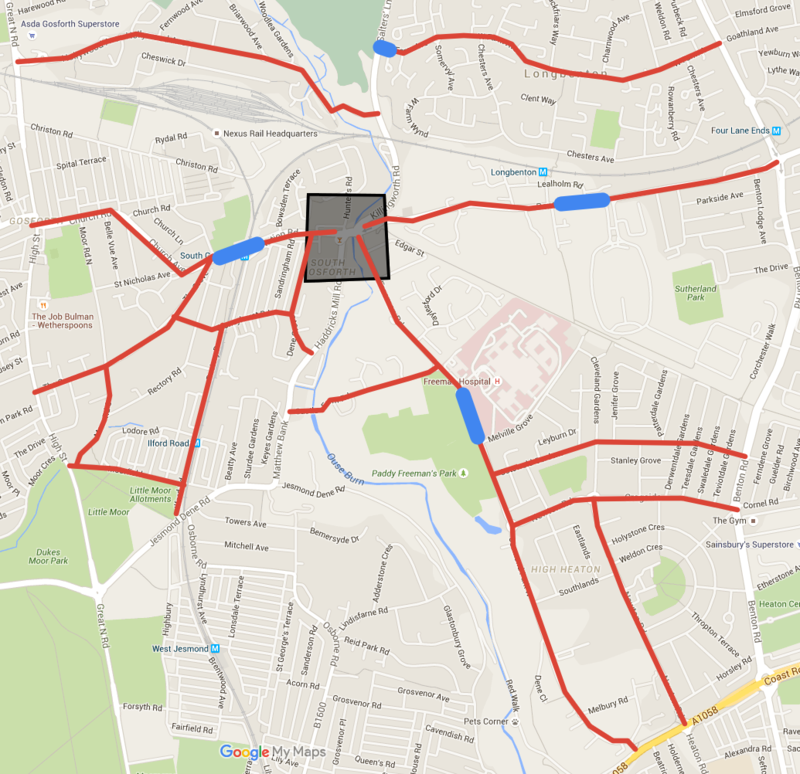 Furthermore, the route passes much less through and along people’s homes than using Benton Park Road. There are plans underway to widen the Metro bridge on Killingworth Road allowing for a wider carriageway which could fit in with our suggested routing. Not all is perfect. 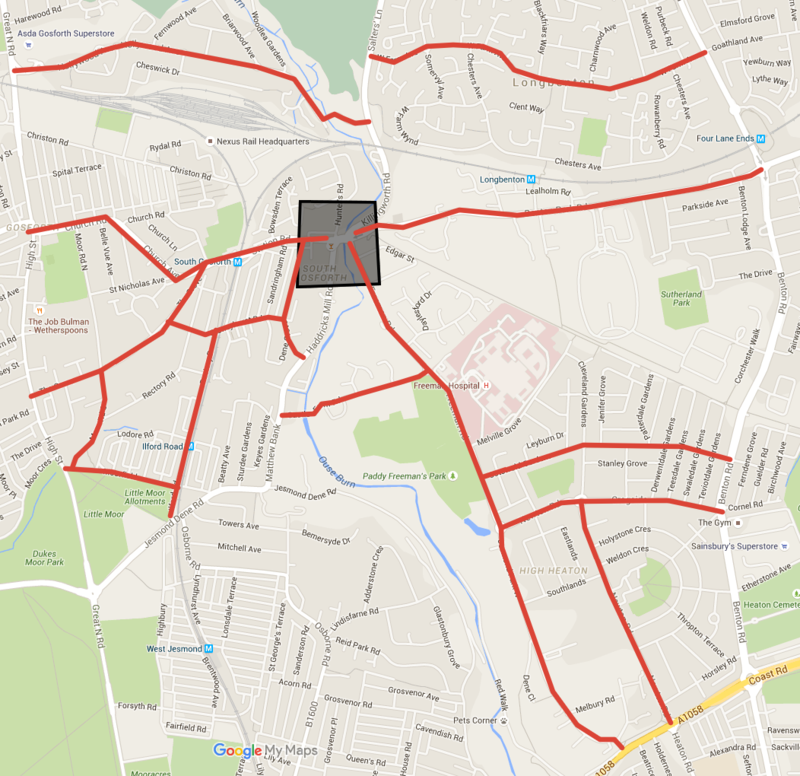 There are still issues with other sections of this route just as there are with most of the rest of the Northern Access Corridor, especially where it passes at the front of people’s houses. In short, this proposal shows how Benton Park Road could be mode-filtered by cutting motor vehicle traffic access. Walking and cycling, and perhaps bus access could still pass through. In the next map we have marked all the other potential rat runs that must be addressed. 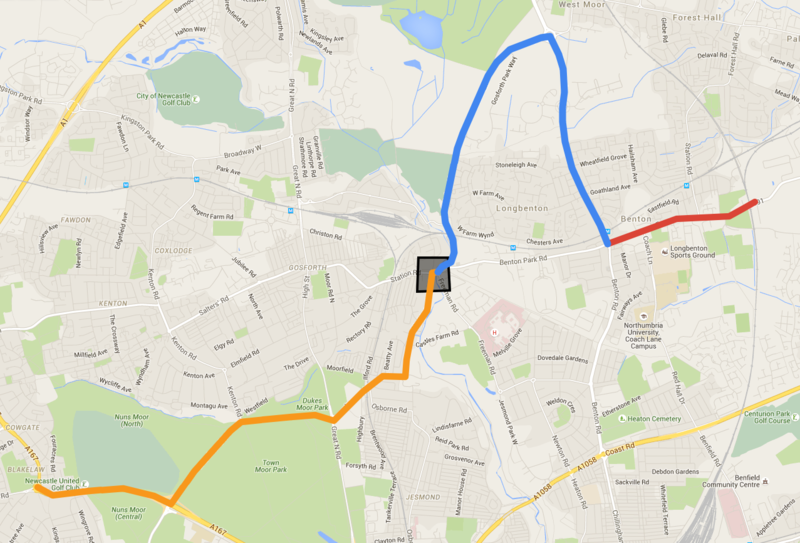 This is to ensure that the motor traffic remains on the designated access corridor around the Haddrick’s Mill area. We will now discuss some ways in which these rat runs could be closed, to ensure that all traffic except local access traffic remains on the Northern Access Corridor. Newcastle council has routing tools it can use. For example, city council has been introducing bus gates in select places in the city. A bus gate is a sections of road where private motor traffic is stopped off, but other modes of transport (such as buses) are allowed through. This section should include protected cycleways to keep cycles and buses separated. The council are also able to use cameras to automate the enforcement of these sections of road making it easier and cheaper to effectively operate the bus gates. We will look at four locations these gates could be introduced to remove private motor through traffic from some of the roads. On the map below we have shown where these points in Blue. With these bus gates in place, some rat-running routes would still remain. We have suggested locations where these could be closed except for pedestrians and cyclists – shown in Green below. We continue to feel that the Northern Access Corridor is ill thought out. We are still asking, what is the corridor for? What’s its intended purpose and justification? The plan, as we came to understand it, seems to wrongly encourage high levels of motor traffic over the health and wellbeing of Newcastle residents who will suffer noise and air pollution – tragically a common ‘side effect’ in car-centric planning. We hope that the council will rethink their plan trying to push even more traffic through our urban neighbourhoods in Newcastle. Traffic reduction is something transport planning should be much more concerned with than it currently practically is. How has traffic planning considered the social and environmental aspects? If the council do decide to continue with their plan, then we have highlighted some simple ways in which the motor route can be access-controlled, cutting rat running in the surrounding areas and improving environmental conditions for those living there. Council also would have to think through in much more detail the provision for cycling. A protected cycleway would be needed, due to the danger and risk the fast, heavy motor traffic would pose along the Northern Access Corridor. From a transport planning point of view, creating a longer route for driving should make it less attractive as a through route, so much so that more people would choose to use the major roads – A1 and A19 – to bypass the area. This would mean that A1 and A19 would be used as a classic ring road system, which we would welcome. Overall, we ask council to carry out some serious transport planning for Haddrick’s Mill, Gosforth, and Newcastle in general. The Northern Access Corridor is ill situated and not needed in a compact city like Newcastle, unless it is planned as a green corridor (walking, cycling and bus). As we know from other cities, much can be done by routing and zoning. We implore Newcastle to apply these principles, and ask politicians to challenge the officers, as well as the transport planning section to lay open their plans and considerations.